BABY COMES, I'M MOVING OUT"
A generation ago, Martha Alexander published a children's book, "And My Mean Old Mother Will Be Sorry, Blackboard Bear," exploring a conflict between a mother and son. It was in the beginning of a 40-year career that the Kailua artist and illustrator would devote to books that help ease the pains, fears and jealousies of childhood. The popular "Blackboard Bear" series centered on a boy and his imaginary friend, a bear that he drew on the blackboard. Other books focused on precarious childhood frolics. Alexander died in January at age 85, but her stories live on through her children's books, which are being re-released this spring, and in the tales her friends continue to share. Friends and family members describe her as ageless, with an incredible zest for life. Mother's Day seems a fitting time to rediscover Alexander's playful drawings and her heartwarming stories that personify the mother-child bond in a way that rings true decades after they were written. "I steal ideas from children," is the way Alexander herself spoke of her stories. She authored and illustrated nearly 70 children's books. 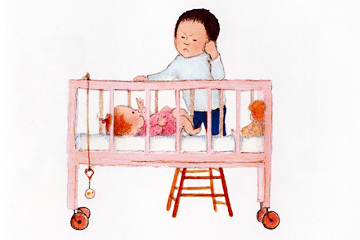 Some of her first illustrations were found in "Big Sister and Little Sister," written by Charlotte Zolotow and published in 1966 by Harper & Row. 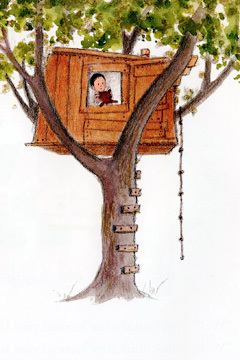 "Nobody Asked ME if I Wanted a Baby Sister," "When the Baby Comes Out, I'm Moving Out" and "I'll Protect You from the Jungle Beasts" are the titles being reissued by Charlesbridge this year. All three were authored and illustrated by Alexander. IF I WANTED A BABY SISTER"
Through Oliver in "Nobody Asked ME if I Wanted a Baby Sister," Martha Alexander addressed the concerns of children. She authored and illustrated some 70 children's books. Her books addressed real feelings that children experience. "When the Baby Comes Out, I'm Moving Out" teaches siblings how to ease into their new role. And in "Nobody Asked ME if I Wanted a Baby Sister," little Oliver is angry when a new baby takes over his mother's attention and all of his old toys. He considers moving out or giving her away. When his wee baby sister turns to him for comfort, he learns that having a baby sister is not all bad. Alexander was known for teaching life lessons -- most important, how to dream big. Her fun loving, unpredictable and zany ways drew others in. "I learned a lot from Martha," said Jan Westfall, a longtime friend from Alaska. "I learned that any dream is possible if you try hard enough. And, if it doesn't work out, you move on to the next dream." Alexander was born in Augusta, Ga., and moved to Ohio when she was 9. "She was a frail, sickly kid, but that didn't stop her from making doll clothes, dollhouses and all of her own clothes," her daughter, Kimon "Kim" Iannetta, said. She attended the Art Academy of Cincinnati, where she met her future husband, Bill Stamper, Iannetta's dad. They moved to Hawaii when Stamper was commissioned for restoration work at the Honolulu Academy of Arts. Later, the couple was instrumental in the early development of the Art Center at the Honolulu Academy of Arts. "The Art Center was set up for returning soldiers on the GI Bill. ... There were no other comparable programs at the time," said Allen Stamper, Alexander's son, who is also an artist. "My mother taught some classes at the academy, but her main focus was on family and the home," Iannetta added. "I remember her doing our laundry on a washboard." 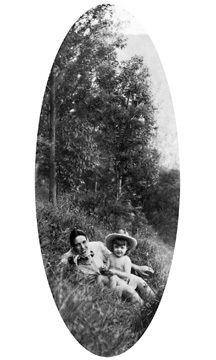 A young Martha Alexander with her daughter Kim Iannetta in 1945. Bill Stamper and Alexander divorced in 1959, and Alexander packed up and moved her two children to New York, in hopes of becoming an illustrator. The "feminine and frail lady" became a "powerhouse," according to Iannetta. "She worked hard at being her own person. ... She struggled really hard." Alexander lived in many places, from New York and Alaska to Washington and Oregon. She returned to Hawaii to be closer to her family. Iannetta was often aghast at her mother's antics. "She was a dreamer. The fantasies from her books often overflowed into her life," she said. "Once she created a garden of edibles. The walkways were lined with cabbages and broccoli. Her way of doing things was always very unique." Westfall was also quite familiar with Alexander's over-the-top ways. "I never really knew what Martha would do next, which is why she was so much fun to know." She was always remodeling old homes, Westfall said. "I'll never forget her sitting on a ladder to make sure the windows were going to be placed in the right places so the view would be perfect. How many 60-year-old ladies would even think of climbing up on a shaky ladder on the side of a mountain just to make sure the view was going to be good?" 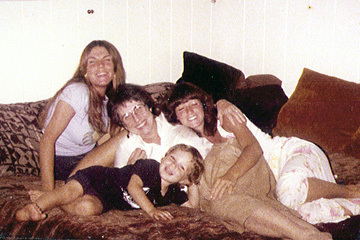 Martha Alexander enjoys quality time with her daughters and grandson in 1980s. They are, clockwise from left, Lisa Pestana, Alexander, Kim Iannetta and grandson Beau Hayden. One night, Alexander tired of the color of her walls and decided to paint them. "Instead of asking someone to help move the furniture, she painted around it," chuckled Westfall. "I learned that things don't need to match ... and that it's great fun to play with color." When she was 80, Alexander decided she'd never liked her name, so she ditched Martha and became Savanna. "If she didn't like something, she would simply change it," Westfall said. "She encouraged people to become what they really wanted to be." Jane Yelliott, her younger sister from Tennessee, said Alexander had a knack for meeting others' needs. "She gave of herself, quite often to the detriment of her own well-being. People leaned on Martha and she didn't back away." Alexander once visited a classroom in Alaska for a "Newcomers Program," involving teenagers from all different nations who were studying English, American culture and history. The colorful illustrations in her books helped her communicate with teens who couldn't speak English. "Martha stood in front of them and talked about her books. The kids were quiet and very interested in what Martha had to say," said Westfall. "When we left the classroom, Martha said it was like being in a miniature United Nations and wished the program was available everywhere.